Is your home insurance PLAN not really FAIR? Stuck in the Fair Plan? Click here for help with for qualified properties. Customers looking to Update their Homeowner Information Click Here. What are the basics of Homeowners Insurance? If you rent a home to others, a traditional home insurance policy will not protect you. For that, you need a Dwelling Fire policy. One of the many fine companies that we represent here at Elliot Whittier Insurance is The Travelers. Check out this Insurance 101 video from our friends at Travelers Insurance for a great basic video on Home Insurance. There's a lot more to your home insurance policy than just the building, the contents, and the liability. Some of the following coverages may be included in your policy, and some may need to be added by endorsement. Scheduling expensive items such as jewelry, watches, silverware, etc. As always, you should speak to us or to your agent if you have any questions on what your policy covers. 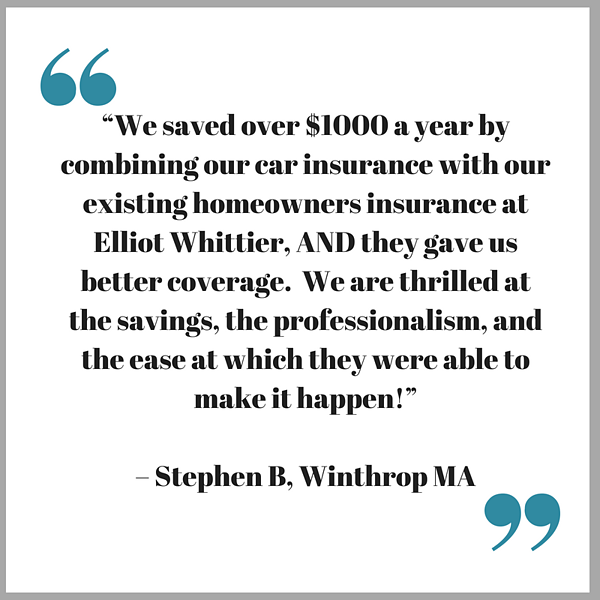 At Elliot Whittier, we are independent insurance agents. That means we have multiple home insurance companies we work with, not just One Big One! We pride ourselves on our ability to find you the most appropriate coverage for you and for your family and the best available rates. What is not covered by my home insurance policy? One may wonder, what's not covered on my home insurance? Damage caused by most disasters is covered but there are exceptions. The most significant are damage caused by floods, earthquakes and poor maintenance. You must buy separate policies for flood and earthquake coverage. Maintenance-related problems are the homeowners' responsibility.. Combine your car insurance with your home, renters or condo insurance at Elliot Whittier, for even MORE discounting. How do you find the best discounts for home insurance in Massachusetts? Often when you buy a new insurance policy, the insurance company will send someone out to inspect the home and check for hazards that may cause injury or maintenance issues. Do you know what some of the potential dangers could be? Take this quick test from our friends at Safeco Insurance to see if you can identify some of them. Talk to a real person for help with your Massachusetts home, condo, or renter's insurance. Contact us today at 617-846-5000 to find out more! You can also connect with us 24/7/365 by filling out the short form on the righ.